Hello, How are you generators ?, I hope very well, today I come to bring you 2 very punctual tips to make money at the end of this month, lately the price of sbd and steem have been falling as well as prices of the other currencies. This new year has not started on the right foot for cryptocurrencies, many have fallen in a large part of their value, many assure that as the coins are not regulated, for my part if I think there is a kind of manipulation, if we see it from a Logically and easily, large companies can manipulate a market by selling or buying large amounts of a specific currency. Remember that money currently moves the world, the one with money can do many things, but at this time you can take money out of certain coins as long as you know what will happen, a few days ago put a post where a page indicated where the next events come out on the coins. 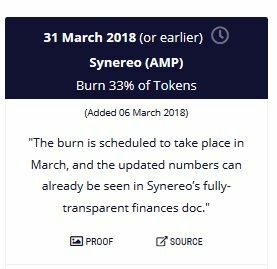 The page is called coinmarketcal, but what I come here to talk about today is what will happen on March 31 in 2 currencies, the first is TRON and the second is SYNEREO or AMP. Both March 31 will burn a part of the total amount of their currencies, remember that the price of currencies fluctuates with the law of supply and demand, if the offer (quantity X of an asset) decreases, the price increases. If the demand rises but the offer does not, the price also goes up. Every time the burning of coins is done, its price always tends to rise more than 20%, and a percentage considered tends to rise always a week before. You can verify this information is always different pages, and through the historical information of different currencies. 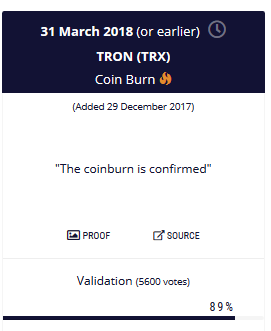 The last coin that made a burn was the PAC, which went from a value of 1 Satoshi to 160 Satoshis.